How do you implement songs into FNAFSB? iT's reaLly noT that tough. btw I juSt GOt a NEw computer, so i should be able to work on all of fnafsb sometime today or tomorrow. I just got my new computer. I am only missing a cord for the monitor. I should get it tomorrow or in the next two weeks. EDIT: I have a temporary monitor (it's really just a small TV), I am now able to work on FNaFSB! 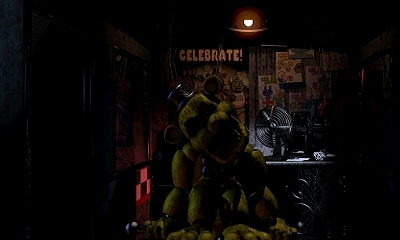 Here's a screenshot of golden freddy! Gilded Freddy... So does it crash the same way? Stagnant Gilded Face and you have to exit? or does it do the BG 888888888 Crash? You should do a BG 888888888 crash XD Also this project is getting so huge, even though I had no interest in FNAF I might try this.